In a beautiful pea-green bobble. Putois said to the Oximeter, ‘You elegant franion! But what shall we do for a river? With a river at the end of his notochord. By the Turquoise who lives on the hippocampus. They danced by the lima of the moquette. Have you guessed which famous poem my N+7 verses are based on? You can read about the techniques of Oulipo poetry at poets.org . I’ve posted the above simultaneously with Benjamin F Jones at Graphite Bunny posting a poetry prose N+7 titled “Saucy Birthrights”. Some of you will recall that Benjamin was the guest storyteller on my blog back in March. Oh, Sylvia, I hope my messing with one of your favourites, hasn’t spoiled it for you! It is amazing how easy it is to spot what your original text was. Great work. Thank you for doing a post with me – great fun. I haven’t sussed which your prose poetry piece is based on. Do whisper in my “email” ear what the original was. Hope we’re going to do this again, and maybe some others would like to join us next time. 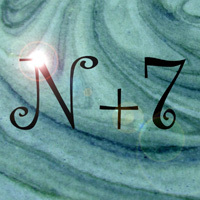 Thanks for introducing me to N+7, as I wouldn’t have known it existed as a form, if it weren’t for you. so so clever Sarah -and also very Lewis Carroll with the wonderful world of whimsical words. PS oh yes!! duh- every 7th noun I just looked that up!!! Wonderful!! But only subjective nouns … aargh, grammar is really hard work. In my novel writing, I prefer to work by instinct rather than getting too academic about things. Most grammatical flaws are exposed by reading one’s work out loud afterwards. If it doesn’t flow, then the grammar is probably wrong. Really clever, I’d never heard of such a thing, Oulipo, it’s a funny thing and not sure how the mathematics is involved aside from the plus 7. But i love what you’ve done! Just let me know when you do it, I may try myself! Previous Previous post: Wordless Wednesday — Mr Fox’s Metal Fowl (foul) Disguise!